No, it's not what you are thinking: the Indianapolis 500 counting towards the F1 World Championship will remain undiscussed - the first time an F1 driver took part in the May classic it hadn't been eligible for World Championship points for a long time. The occasion we are talking about was the first genuine US Grand Prix in 1959, when the F1 circus made its only visit to the Sebring airfield track in Florida, a venue which is now known for its annual 12 Hour sportscar race. It was in this that newly-crowned Indy champ Rodger Ward, hot from his 1959 500 glory, entered an adapted Kurtis-Kraft sprint midget to race against the F1 greats. The dirt-track device - not exactly top-of-form Indy material, we admit - was proudly sporting the No.1 the organizers thought he was entitled to. It was an unfair battle though. 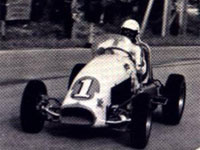 Ward's home advantage was nullified by an Offenhauser engine tuned down to 1.75 litres to comply with F1 regulations. Ward qualified stone-last and was a huge number of laps down when he retired with clutch trouble. So much for the F1 vs. "Indycar" battle... After having won the Indy 500 again in 1962, USAC legend Ward made a one-time return to F1 at the 1963 US GP, this time in a real F1 car: Reg Parnell's Lotus-BRM 24. Again, he hardly made an impression. And we haven't seen any Indycars in 2000, when the F1 World Championship returned to the US after a ten-year absence. But the venue was a classic - just as the first US GP still owns the record for the youngest GP winner ever (Bruce McLaren at 22 years, 3 months and 12 days). But will F1 coming to the sacred Brickyard bring a world-united top single-seater category any closer? Since the man responsible for bringing F1 back to the States in the new millennium created a chasm in Indycar racing with the creation of the IRL, we should have serious doubts.